ANNAPOLIS, Md. — Despite cool temperatures and drenching rain, the mood was bright at Thursday’s opening of the U.S. Sailboat Show in Annapolis, Md. Wearing foul-weather gear, a hardy battalion of serious buyers braved the docks — dodging puddles and dripping awnings — to the delight of exhibitors. Many exhibitors echoed that sentiment. Informed and dedicated buyers paid $35 for Thursday’s VIP pass, versus $18 Friday through Monday, in order to talk with exhibitors and dealers, avoid the crowds and sign on the dotted line. Less-than-ideal weather hit both Annapolis shows with record heat for last week’s powerboat show. “It’s lucky for us the rain has come for the sailing community, as they’re more resilient,” said Tony Lippi, of the Panama Hat Company in St. Augustine, Fla. His Tilley Hat booth had a throng of buyers trying on various wide-brimmed waterproof hats so they could shop in comfort. Some might say they already have. The U.S. 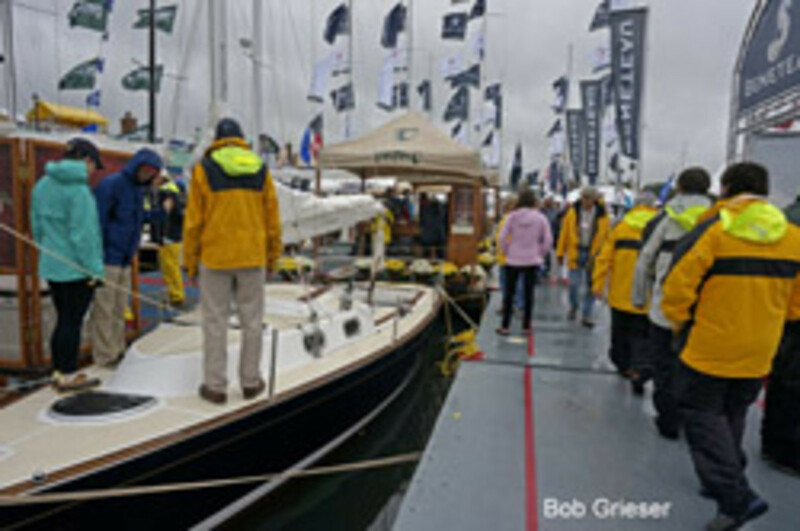 Sailboat Show runs through Monday at the Annapolis City Dock.